I like to write thought provoking blogs that create discussion and comments … much like the government puts out websites that only give some information and cause newspaper headlines. I both like and don’t like the My School website (http://www.myschool.edu.au/). At one level it allows parents to look at their school NAPLAN results and give some idea of how their child’s school is performing on certain standardized tests.I think it is important as a TOOL for enabling parents to become responsible for their child’s learning and to kick up a stink at the GOVERNMENT (not the school) to have appropriate funding for the school. NAPLAN results are standardized content knowledge tests … they DO NOT define a school’s ability to empower their kids to be leaders, to think, to be empathetic, to be caring individuals, .. pretty much everything that schools are there for. In the 21st century it isn’t just about knowing something … it is about knowing how to find it, discern what is useful, apply it in various circumstances, knowing how to use the information that is out there, and preparing children for a world that is changing exponentially. NAPLAN tests are very poor predictors of this. The media, despite being warned that it wasn’t about ranking schools and creating league tables … come out immediately to create league tables of schools. I checked the website … you would have to spend hours pouring over the data one by one to extract that information. Talk about creating the drama when everybody who understands the idea behind the MySchool website has been saying that it isn’t about creating league tables. Finally, and perhaps the most important, the “Index of Community Socio-Educational Advantage” which is used to compare each school with similar schools is flawed. Imagine this, (this is an actual case) your school is in a relative wealthy area (based on house prices) but its feeder is the housing commission flats right near the school. Many of the children are refugees, recent immigrants and generally people who are currenlty living off government benefits. However, because it is a relative wealthy area your ICSEA is skewed and it is rated HIGHER than one of the best private schools in Australia! You are thus compared to schools with the same ICSEA and is rated as a poor performer. We then have the media telling the world they are a crap school via their league tables. The ICSEA doesn’t look at the enrollment data for each school it looks at the suburb data and uses that information … not very clever. 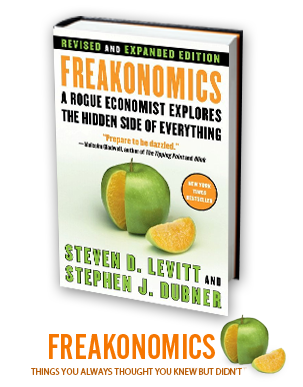 So lets get into the Freakonomics side of this blog and link it all together. As a saying goes … there are statistics and then there are damn statistics. As you can understand when you provide statistics such as the My School website they are open to interpretation by many people who are not trained in interpreting the statistics and what they possibly mean. It is interesting to note that there is NO scientific studies yet performed where a schools performance is CORRELATED to the ICSEA. So what is important for a parent to producing great NAPLAN results? It isn’t what you may think. Steven Levitt, a professor in economics at the University of Chicago and he co-wrote, with Stephen Dubner, a book examining the stats behind a range of wide-ranging questions … from why do drug dealers live at home, what do school teachers and sumo wrestlers have in common, etc. It is a fascinating and fun book which examines the underlying causes of why things happen. Check out the website (http://freakonomicsbook.com/) where it has study guides and more! The authors then go into each and discuss the causality of each factor (e.g what does it mean that a child has many books at home and how could it be correlated to school performance). What do you think? What do you think makes a difference?